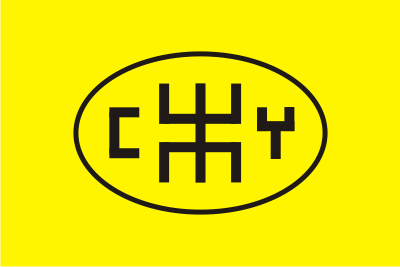 Some years later, on 22 October 1964, Antonio Cubillo founded in Algiers the Movement for the Self-determination and the Independence of the Canarian Archipelago (MPAIAC in Spanish), derived from the Canarian Autonomist Movement. 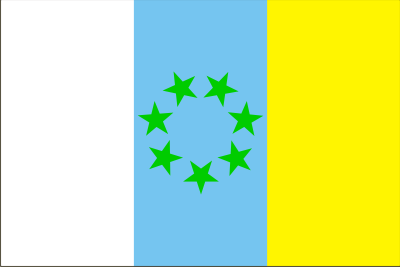 This adopted a tri-colour flag based on that of the Free Canaries, though adding a circle of seven five-pointed green stars on the blue band; this is the first time that green appears in a Canarian flag. As a consequence of it, they had to change the original navy blue of the central band into sky blue to allow the superposed stars to be distinguished. 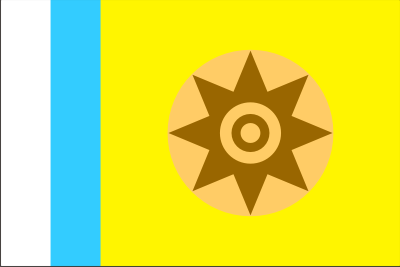 Point 25 of the final Resolution adopted by the MPAIAC at the day of its fundation stated in this regard: ‘the National Flag will consist of three vertical bands of the same size, the first white, the second, that is, that of the center, light blue, and the third yellow. On the central band and in a circle there will be seven green stars that will represent the equality of the seven islands in the blue sea. White, blue and yellow will be the national colours’. The contradiction must be pointed out that the text makes the sky blue shade represent the ‘blue sea’, instead of the navy blue shown in the provincial flags; on the other hand, when it establishes the ‘national colours’ the green of the stars is not mentioned, and blue is not identified either as either light or sky blue. Antonio Cubillo explained the presence of the stars as a reminder of those of the flag of the Ateneo of La Laguna, and he said that green represented the African continent, where the Canary Islands belongs geographically and -according to the MPAIAC- ethnically and culturally. Nevertheless, in MPAIAC's website (www.mpaiac.org) it is said that this organization considers as its own symbol the flag with the green stars. 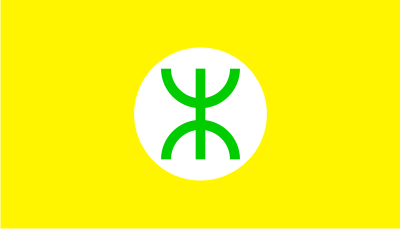 Another flag seen in acts organized by independentist groups shows this same symbol, together with two other amazigh letters. On the other hand, another independentist group claims to have been proclaimed a "Republic of Taknara" (http://www.republicadecanarias.org/repindice.html), that would encompass not only the Canarian Archipelago, but also part of the south of Morocco and the north of Western Sahara. Its flag, based on the one created by Cubillo, includes an aboriginal pintadera (a piece of pottery used to decorate vessels, clothes, etc. ), instead of the stars.